being aligned as a team and not individual players, playing for reasons beyond ourselves. Off the field, FAMILY and do for others. To provide great lacrosse experiences both on and off the field. Our goal is to teach the sport and build confidence in each and every player regardless of skill level. More importantly we will hold our players to the highest standards of sportsmanship. We understand, with time, athletics will fade, but character and integrity built during our events, camps, and training will last a lifetime. We want our players to get the most out of their abilities, but more importantly grow up to be great parents and leaders. Coach Tom DeMaio grew up in New England and has been coaching lacrosse for over 25 years. A former Head Coach at Northeastern University in Boston, Coach DeMaio is regarded as one of the top teachers in the sport with an impressive track record of developing players both on and off the field. Coach DeMaio is currently the Varsity Head Coach at Santa Fe Christian School in San Diego. In 2014, his first year at the helm, he led SFC to an 11-4 record and Division I playoff berth in the highly competitive CIF San Diego Section. The next year he led his program to the first "Open" Division birth in the shcools history at teh 7th ranked team in San Diego. Previously, DeMaio was the Defensive Coordinator for Orange County powerhouse JSERRA Catholic in 2013. Coach DeMaio is known nationally actively involved in growing the game of lacrosse as Director of Operations for Team 12 and Bunch Nation. Under his guidance, this program has flourished winning 30+ tournament titles in the past 5 years and helping countless players get recruited to play at the collegiate level. Most importantly the program prides itself in stressing off the field excellence from their players. DeMaio moved from New England in 2010 with his family of six children all who play lacrosse, settling in Coronado, CA. Coach DeMaio quickly got to work, leading the San Diego All-Star team to the US Lacrosse Central Division Championship in Texas. 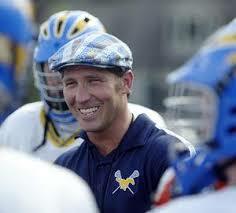 He also coached at Coronado Middle School, where he won an SDCLA Championship in his first season. The first TEAM12 was formed in Orange County in the spring of 2012. The purpose was to teach the game and develop lacrosse IQ for the twenty two middle school players who were willing to learn and improve. The final goal of this team was to start the process of making Orange County Lacrosse more in line with other parts of California and the country and prepare them to be good Varsity players. There were no games, innovative practices sessions, cool uniforms, and a few scrimmages at the end of the season. It was huge success and many of the players on this team went on to start and excel as Varsity players in high school with some already committed to Division 1 Universities to play lacrosse. On this team everyone wore the same number 12 to symbolize selfless play. 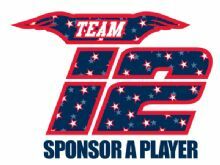 The number 12 is a correlation with the Coach DeMaio’s teachings with Bunch Nation as many of the best and most selfless players have worn the number 12 on Coach’s teams. The philosophy with TEAM12 is simple: TEAM first… being aligned as a team and not individual players, playing for reasons beyond ourselves. Off the field, FAMILY and do for others. The “12” award: The 12 award is given to individuals who give back and fundraise in their communities for great causes, to date we have given out 4 awards in the past two years to individuals who have raised over $15,000 for charitable causes in this time span. 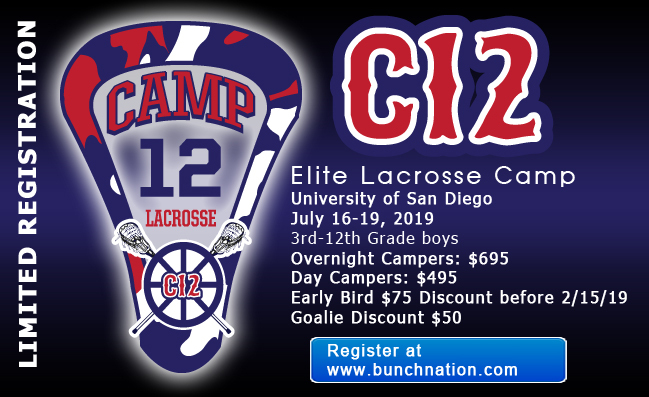 What’s cool about this concept is that the players who participate will be eligible and given preference to Regional and National TEAM12, and BUNCH NATION teams, not to mention the recruiting connections maintained by Coach DeMaio and his staff. The “12” system is a unique and a great opportunity. There are also high level skill camps and clinics in which our players get first preference to be involved in. BIO: Coach DeMaio has over twenty years of collegiate, high school, club and youth coaching experience in Massachusetts and California. DeMaio is known nationally for his coaching successes and dedication to TEACH the game of lacrosse. There will be no tryouts for this team as most of the players are well known. Local directors will recommend players to participate. Local Coaches will also be utilized under the direction of Coach DeMaio and his staff. Coach DeMaio talked about what makes the @legends_lacrosse National Cup so special after his squad, Team12, took home the championship in the Legends Elite A Division. Current Santa Fe Christian (Solana Beach, Calif.) high school lacrosse head coach Tom DeMaio spoke with LaxRecords.com in Episode 2 of the podcast. Among the topics discussed are what skills does it take to improve your lacrosse game, differences between a junior varsity and varsity player and what players can do to take their game to the next level today. BUNCH NATION12 takes 2 titles at SB Showdown!!! C12 Elite Lacrosse Camp is Open! BUNCH will travel to Tampa, Florida for National Championship!!!! Soulgrind Lacrosse wants players to have a great experience playing lacrosse on and off the field. We strive to provide a memorable tournament experience and expect our players to participate with a focus on the big picture rather than personal success. T12 events, camps, or tournaments.